All of this was wonderful. So wonderful in fact that I was inspired to open several additional shops, with breakout lines such as LaPatisserie (sweet little rings using cakes and vintage buttons). 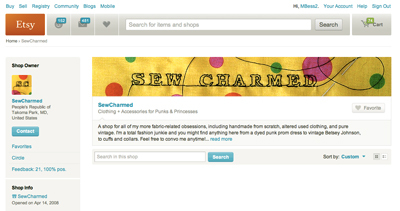 And another shop, SewCharmed to sell vintage clothing and sewn items. There were at least 2 additional shops; a veritable Etsy empire, I thought. For those of you who like numbers, all told, I made 500 sales +/- on Etsy in a 4-year period. Those numbers, however, are kind of meaningless in terms of how much income I realized via Etsy. It’s a much longer story for another time (or not), but suffice to say, that even at peak performance on Etsy–a few hundred sales per year, I was real real real glad I hadn’t quit my dayjob (despite Etsy’s then-constant promotion of just that very dream). Etsy was brief for me. Around the time of my becoming rather discouraged with the site… decreased sales and an ever-growing presence of jewelry (when I checked this morning, there were 2,965,000+/- pieces listed on the site), with prices for jewelry lowering ridiculously (current average price of an Etsy sale: $15-$20 with 3.5% going to paypal and 3.5% to Etsy), with an insane number of resellers, ie, “handcrafters” selling cheap jewelry manufactured in factories (mostly China)… and a maddening number of copycat “artists” blatantly stealing every new idea that comes along, a site popped up on the internet humor scene to poke fun at all of this alleged glitter-huffing. 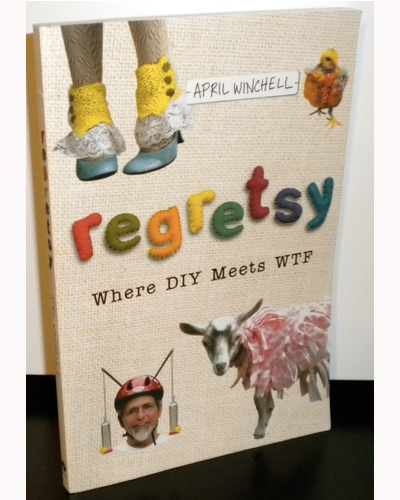 Enter: Regretsy, where DIY meets WTF. 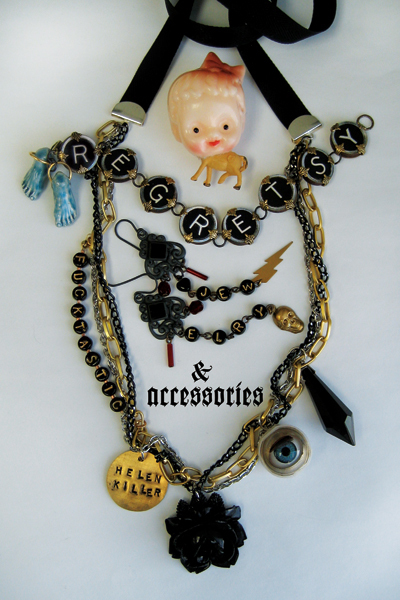 Somehow, I happened upon Regretsy from its very first post, and after overcoming my jealousy at not creating the site myself, I became one of its biggest fans. It is… hilarious. And mean. And hilarious. I exchanged a few emails with April Winchell, the cool, funnygirl founder of the site and was shortly after invited by her to create the divider page for the jewelry section of her upcoming book. Above is one of the images I created, below is the one she chose to publish. I was never sure if anyone got the little Jew joke I put in. I thought April would love that. Then, with my increasing Etsy discouragement, I refreshed the design and blog of my site, rethinking what I wanted to make (and sell), and determining that with the limited hours (fulltime job, parenting, family, etc) that I have to pursue personal creativity and art (as opposed to my client-centered professional design work), I just couldn’t bring myself to focus on listing amongst nearly 3 million pieces of cheap jewelry in the closed retail wholesale world of Etsy (you have to have an account to shop there). And please, don’t get me wrong: there is some real, amazing talent over on Etsy a few people I’ve seen make sales in the thousands or tens of thousands… deservedly. 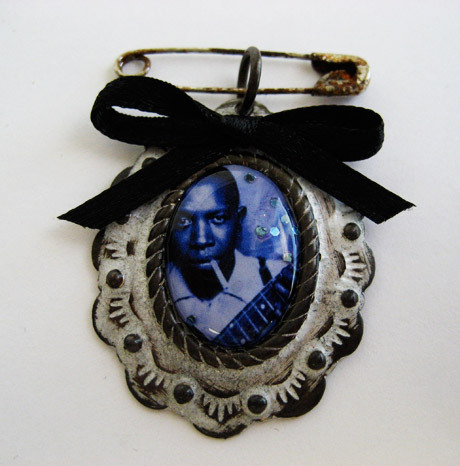 There is fantastic original jewelry, and many other wonderful handmade goods from soap to clothing. For supplies and vintage… Etsy still rocks, bigtime. 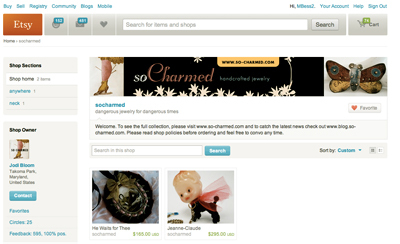 (BTW, all of Etsy’s top sellers sell jewelry supplies… duh!) I still love the idea of Etsy and I still wish all of the vendors nothing but success in their making and sales. My Etsy shops are empty(ing), as are so many other sellers’. Because it costs nothing to have a shop on Etsy, I’m not going to officially close them down; it was a lot of work setting them up and they contain online histories of work, sales, purchases, and customers that I wouldn’t want to lose. I reserve my right to change my mind about Etsy, should the admins find ways to truly support the hardworking, orignal artists that are paying their bills. So, no regrets. PS: So what is the answer to successfully selling handmade goods? Shows? Brick ‘n mortar boutiques? Other sites like Dawanda? A best friend on the Barney’s buyer team? Sorry, haven’t found the answer yet! Will keep ya posted! I share your Etsy frustrations, although I’m stuck with them for the time being because i don’t have the resources/know-how/time/patience to sell through my own site. Our sales were pretty pathetic before we started offering handmade beads as well as our finished jewelry. 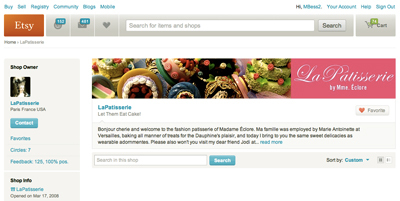 As for Regretsy- I have love/hate feelings toward the site. I’ve seen some artists try to defend their work and just get ripped to shreds in the comments. That’s when it’s not so funny any more. But, I do enjoy the truly bizarro stuff she finds. Also, I wrote in the Honey Bijou blog about the Love Knot necklace you sent me, but I think I forgot to actually thank YOU. 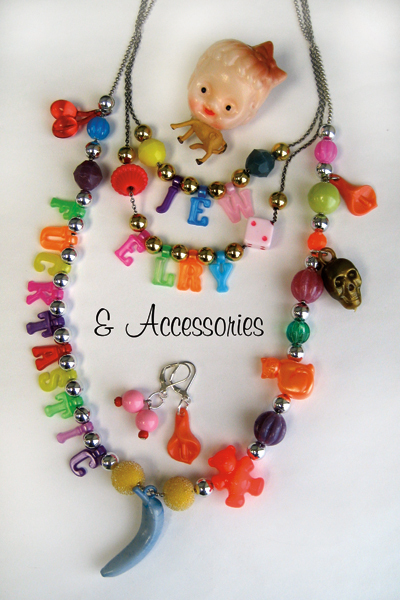 I wear it all the time, and it goes with everything and is fun to layer with other necklaces. Also, the box it came in was awesome. It’s sitting on my studio table waiting to be re-purposed somehow. Thankya thankya!